Just 20 minutes north of Manistee, Onekama is the first community along the M-22 Scenic Heritage Route. 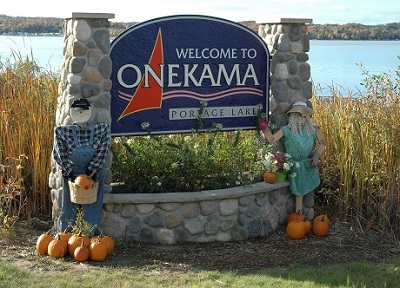 Commonly known as the "Two Lake Town," Onekama offers a combination of Lake Michigan shoreline and peaceful views of Portage Lake. Portage Point Resort: Over one hundred years old, the resort not only holds historic value but continues to provide Onekama with a place for people to gather and has been restored into a great place to stay. Pierport Beach: At the end of 13 Mile Road, this secluded beach is great place to enjoy the lake and see the sunset without the crowds. Manistee County Fairgrounds: The Manistee County Fair is every year in late August, but the fairgrounds are utilized throughout the year for different events. The main hub of Onekama is right along M-22. Enjoy fresh coffee and homemade treats at the Yellow Dog Cafe. Fine dining awaits at The Glenwood. In the summer, Onekama has Monday Night Concerts in the Park featuring many local artists from all around. The Onekama Art Snake is a fun July event that displays many works of locals artists. In October, check out the annual Fall Festival in the Village Park. Portage Point Resort has been in operation for over 100 years and has recently been restored to the majestic vacation escape it once was. With an infinity pool and access to both Portage Lake and Lake Michigan, it’s a water recreation paradise. Stay for awhile or stop by for a bite at the Portage Point Cafe. You won’t regret the view. On your way to the resort on Portage Point Drive, stop at the Artesian well, locally known as the Fountain of Youth, to fill up with fresh water right out of the pump. Manistee Area Chamber of Commerce.